The song is the first from Sarz and WurlD’s upcoming collaborative album. Premiering today on The FADER is a new collaboration from the two called “Trobül,” and it’s the lead single from an upcoming collaborative project of the same name. The track’s a slower one, Sarz’s sensual and pared-down production providing the perfect grooves for WurlD’s voice to shine and soar over, ringing clear as he sings about the only woman he’s got eyes for. “The vision behind creating this song was to add a new dimension to Afro-inspired music,” WurlD shared with The FADER over email, “while moving the culture forward progressively. 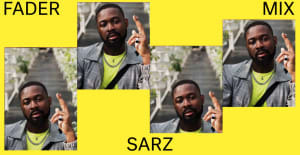 SARZ chimed in about the collaboration as well, sharing, “If there’s one thing I love about Trobül, it definitely has to be how natural making this amazing song came about. Energies don’t lie.” Listen to Trobül above, and look out for Sarz and WurlD’s collaborative project of the same name, due out this summer.